It’s rare today to find an author who does nothing but write for a living. Do you have a ‘real’ job other than writing, and if so, what is it? What are some other jobs you’ve had in your life? Karen Quinn: I started out as a lawyer and absolutely hated that. After I dozed off in front of my client during an SEC hearing, I quit that. Luckily, the client died that year so he never sued me for malpractice. Then I moved into marketing and advertising. I worked for American Express for fifteen years until they downsized me. At that point, I came up with the idea of starting a small business helping NYC families get their children into the best private schools. The company was called Smart City Kids – it still exists today. But after two-and-a-half years, I got out. There were too many tears – not from the children, from their parents. What compelled you to write your first book? Karen Quinn: After leaving Smart City Kids, my husband wanted me to get a job. We really needed the money. But I had always had a dream about being a writer. I’d never done anything about it – it was like one of those fantasies we have about becoming a movie star. Wait, I take that back. I did always write a holiday letter that everyone said made them laugh. Anyway, I realized that after leaving my company, I had lots of funny stories about my experiences helping these neurotic parents and their adorable kids. So I told my husband that instead of getting a job, I wanted to write a bestseller like The Nanny Diaries about getting kids into private school. Mark asked me how long that would take. I had no idea so I told him three months. He let me go ahead as long as I promised to get a job after three months. I wrote like crazy after that and had a first draft of The Ivy Chronicles done before my deadline. The threat of having to get a real job is a powerful motivator when it comes to writing. Karen Quinn: No, I have always wanted to be a painter. That’s something I love to do and I’m good at it (in a Grandma Moses kind of way). My home is filled with paintings I’ve done. But I discovered when I wrote The Ivy Chronicles that I genuinely love to write. It’s very exciting to discover something new about yourself when you’re in your mid-forties. Tell us a little bit about your book/s. Karen Quinn: The Ivy Chronicles is the first book. It is about a woman who reinvents herself after losing everything that is dear to her – her husband, her upper-east-side lifestyle, her job. She starts a business helping families get their children into private school. Through this, she discovers a new life for herself that is better than the old one. I wrote Ivy at a time when I had lost my corporate job and I reinvented myself by becoming an author. So that book is particularly close to my heart. Wife in the Fast Lane is about a mid-western girl, a track star turned businesswoman, who marries a powerful mogul and moves to the upper-east-side. It is about how she juggles the demands of work, love, and motherhood in the most exclusive zip code in Manhattan. 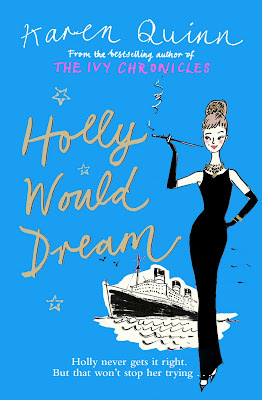 Finally, Holly Would Dream is about a woman named Holly who wishes her life was like an Audrey Hepburn-Cary Grant movie, but of course it isn’t, until it is. This one is really a modern day fairy tale that is about all the things I adore – fashion, travel, and old, romantic movies from the 1950’s. Holly Would Dream is my favorite of the three I’ve written. My books tend to be women’s fiction, page-turners, and funny. Are you currently working on any writing projects our readers should watch for release soon? Karen Quinn: Just this week it was announced that Sarah Jessica Parker is going to star in The Ivy Chronicles movie. So readers should look out for that. I am also working on a fourth book about three sisters in Manhattan, but I’m not sure when it will be done. I’m also doing a non-fiction book about what parents can do at home to be sure their children are ready for kindergarten. Have you ever won any writing awards? If so, what? Karen Quinn: No, I haven’t. My books are perfect for the beach, long airplane rides, or to take you to another world after a long hard day. I don’t think they give awards for books like that. But they really should, don’t you think? Call me shallow (and I’m sure someone will), but I’d rather read the latest Bushnell than Dostoevsky any day. How did you feel the day you held the copy of your first book in your hands? Karen Quinn: It felt like I had accomplished something wonderful. I was so proud of it. No one was home when it arrived so I ran downstairs and showed my doormen. Now they treat me like a movie star and they always buy my books for their mothers and wives. What type of music, if any, do you listen to while you write? Karen Quinn: I’m very ADD so I don’t listen to music while I write. When I do listen, it tends to be songs written in the eighties or earlier. What inspires you and motivates you to write the very most? Karen Quinn: When I am really into a good story, I can’t wait to get to the computer. What will my characters do today? I often have plans for them and then they surprise me. When I sit down to write, I can go for a good eight hours. What one thing are you the most proud of in your life? Awesome interview! And thanks again for hosting me on your blog in May. I wonder if you’d be interested in helping me with a blog tour I’m setting up for a friend of mine. Would you drop me a note at tap@tristipinkston.com and I’ll fill you in? I think that might be the funniest author interview I’ve read yet!